This paper examines Hồi giáo, a state-recognized religion translated as “Islam” in Vietnam, and will focus on the Islamic religious practices of the Cham Bani, one of two groups of Muslims in Vietnam. While it is recognized that diverse Islamic religious practices have taken root in various areas, there is a tendency to view religious practices such as the Quran recital, Ramadan, Salat, and so on, with a sweeping uniformity. As such, regardless of how “unorthodox” they are, the people who engage in such practices within society are regarded, or classified, as Muslim. The Cham Bani have also been described as an unorthodox Muslim sect, on the basis of its syncretic religious practices. However, the Cham Bani practitioners see themselves as neither Muslim nor members of the Islam community, and consider that they have experienced a different evolution of Islamic religious elements. Is it possible to equate Hồi giáo with Islam and its followers with Muslim? This paper examines these questions through observations of the self-recognition, as well as the actual conditions of Islamic practices among the Cham Bani, especially the rituals that are observed during Ramadan. It reveals the possibility that Vietnam’s state-recognized religious sect of “Islam” and its “Muslim” followers are polythetic in nature and differ from the conventional definitions of Islam and Muslim, based on a monothetic classification. Since the Doi Moi policy, religion has been discussed actively in Vietnam so as to maintain national unification as well as to construct a national identity in the country’s new period. In 2007, the White Paper on Religion and Policies was released with a special reference to the six state-recognized religions: Buddhism, Catholicism, Protestantism, Islam, Cao Dai, and Hoa Hao (Vietnam, Government Committee for Religious Affairs (GCRA) 2006).1) In this paper, I examine the state-recognized Islam, Hồi giáo, in order to contribute to an understanding of a peripheral aspect of Muslim. Ever since the French colonial period, contemporary academia has researched the religious situation of Cham Bani. Records left by missionaries and colonial administrators indicate that the Cham Bani, or “les Chams musulmans du Sud-Annam,” recite the Quran and believe in Allah, yet do not strictly follow the Islamic faith. They do not recite prayers five times a day; they believe in gods other than Allah; and during Ramadan, only monks fast. For these reasons, the Cham Bani are described variously as “Shiites” (Catabon 1901, 4; Durand 1903, 54) or “. . . musulmans, d’ailleurs peu orthodox” (Ner 1942, 154). The descriptions of the Cham Bani, based on the Western Christian concept of religion, have not changed greatly till today (Phan et al. 1991; Phan 1993; Phú 2004). Indeed, not all of the people who are officially classified as “Islam” or Hồi giáo in Vietnam identify themselves as Muslim; the Cham Bani people especially do not have such self-identification. They usually say that they are the followers of Hồi giáo but not Islam; more specifically they identify themselves as Hồi giáo or Bani, but not as Muslims. This raises the question whether Hồi giáo can be translated as Muslim. Some of the Cham Bani villagers and intellectuals whom I approached claim that it is a mistake to view them as Muslims. As I will explore further below, they view Cham Bani as one branch of the “Cham religion,” rather than of Islam. While Cham Islam and Cham Bani are both ethnic Cham, the former tends to regard the latter as non-Muslims, and many Cham Bani intellectuals think of themselves as non-Muslims as well. How did such a gap between the official/scholarly discourse and the practitioners’ perception emerge? Is Hồi giáo, a state-recognized religion translated as “Islam” in Vietnam, axiomatically the same as Islam, and are its followers Muslim? It should be noted that because of this gap, I differentiate between the Vietnamese state-recognized category of “Muslim” in this paper and Muslim as generally defined. Perhaps this difference is caused by the method of classification of Islam or Muslim. In general, Islam and Muslim are defined in an essentialist way; indeed, faced with “the diversity of Islam,” there is a tendency, as numerous previous ethnographic descriptions have made clear, to view such practices as the recitation of the Quran, the Islamic prayer (salat), or fasting of Ramadan as having uniform meanings for Muslims worldwide. In addition, there is a tendency to view the various religious practices of Muslims in local societies as “a variation of Islam,” or else to categorically divide the local religious elements into “Islamic” or “non-Islamic.”4) The Cham Bani have been classified as Islam because of the presence of Islamic elements such as prayers to Allah or recitations of the Quran. Meanwhile, the practitioners themselves do not necessarily subscribe to such categorizations. Most of the villagers in Cham Bani society do not distinguish between the “Islamic” and “non-Islamic” elements of their religion. In other words, the villagers’ Islamic religious practices are more similar to those of practical religion.5) Moreover, in Cham Bani society, Islamic religious practices vary depending on gender or social stratum. In fact, most of the villagers do not recite the Quran, and they even eat pork outside the village. Despite these “ambiguous” practices, the religion has been described as “Muslim,” and the religious elements have been described separately as Islamic/non- Islamic, or orthodox/non-orthodox in ethnographic writing or religious documents. The conventional definition of Islam, or Muslim, is usually made on the assumption that the followers share certain practices or belief systems. However, among the Cham Bani, the Vietnamese “Muslim,” it is unclear whether its followers have common Islamic practices or belief systems. Wittgenstein has shown that such a definition based on the idea that a concept has one essential common feature is unrealistic and advocates instead the concept of “family resemblance” (Wittgenstein 1967). The anthropologist Rodney Needham has incorporated his concept into anthropology and insists that such anthropological concepts of “family” and “marriage” cannot apply to the whole society. Additionally, he borrowed two classifications from natural sciences: monothetic and polythetic. The monothetic classification is one in which an individual of a certain class possesses at least one common feature. In the polythetic classification, an individual of a class does not share even one feature as a whole (Needham 1975). Shirakawa applied this polythetic classification to the study of religion. Mentioning the policy of separation of Shintoism and Buddhism implemented by the Meiji government, he focused on the historical regional expansion of Jisha and Kenmitsu as ambiguous classes and reconsidered the syncretic fusion of Shintoism and Buddhism in Japan from the perspective of polythetic class (Shirakawa 2007). Examining the religious discourse in modern Japan, he points out the importance of describing a religious situation that is “natural” for the people who live inside of it, not as a variation of religious syncretism. Using Needham’s polythetic classification and referring to Shirakawa’s work, this paper focuses on the dynamic evolution of Islamic religious practices that differ depending on gender or social strata among the Cham Bani. The paper then considers the possibility of understanding Hồi giáo or “Muslim” in Vietnam as a polythetic class. The Cham Bani live mainly in Ninh Thuan and Binh Thuan provinces, in south-central Vietnam. These provinces are where Panduranga, part of the kingdom of Champa, was found. Another religious group of the Cham exists here, usually referred to by Vietnamese scholars and officials as Cham Balamon, the followers of Bà la môn giáo.6) These two religious groups inhabit separate villages; intermarriage, although not explicitly forbidden, is rare and is, in fact, said to have been formerly taboo. The people of both groups are matrilineal and conform to the practice of matrilocal residence, with houses of the same descent group usually neighboring one another. The sphere dominated by members of the same descent group is called laga, and its members constitute fluid units on occasions of rituals, such as ancestor worshipping, while a unit of expenditure or the production of daily life is basically one household, which is composed of a husband, wife, and their children. Members of the same descent group recognize each other through the cemetery or gravesite of the group, and also through a lineage deity called achiet atau, who is worshipped in a basket and maintained by a woman called po atau (landlord of atau), of the descent group. 2001, the population of the Cham Islam in Ninh Thuan province was 1,791, which counted four masjid. Thus the majority of the “Muslim” population in this region consists of the Cham Bani. The more than 40,000 Cham Bani of Ninh Thuan and Binh Thuan provinces are scattered over 20 villages. Each village of Cham Bani usually has one masjid called thang magik. Bac Binh district, Binh Thuan province.8) The village has approximately 3,800 inhabitants and most are of Cham Bani origin. The majority of the villagers earn their living by growing paddy rice; however, since harvests are irregular because of the dry climate and poor soil, many villagers work on the side—making charcoal, collecting firewood, weaving, working as a housemaid in town, etc.—in order to supplement their income. Certain religious practices prevail in the village, such as worship of the village god called po yang or po palei at a place of worship called bimon; worship of po Auluah (Allah), which has roots in Islam, at the thang magik (masjid); worship of the dead such as ancestor worship, and worship of the lineage deity achiet atau as mentioned previously. Until the middle of the twentieth century, villagers used to live on a hill at the foot of a mountain, but today they live on some flat land close to National Highway 1.9) Although the hill area is no longer the site of daily activities, there remain graves, fields, and a religious building for bimon worshipping, the mausoleum of a Champa king or his servant, Po Klong Sak. On the flat land can be found paddy fields and buildings, including the village office, a clinic, a post office, an elementary school, and a thang magik for worshipping po Auluah. Source: Author’s research at Y Village in 2003. In short, religious affairs are divided into two categories in the village. Rituals related to po Auluah thang magik, as well as the rites of passage, are served by aca who have knowledge of kura’an; rituals for po yang, the village god, and lineage deities are led by on muduon Po Auluah (Allah), thang magik (masjid), and kura’an are regarded as Islamic elements, having originated from Islam; however, they have been co-opted and practiced quite differently in the Cham Bani society such that describing them simply as examples of “the diversity among commodities of Islam” is limiting and possibly inaccurate. In the next section, I describe how these elements are practiced in the region. In this section, I will focus on three Islamic elements of the Cham Bani village: the thang magik, the recitation of the kura’an, and rituals conducted during Ramadan, called Ramuwan. Photo 1 shows the exterior of a thang magik. Its front wall is encased in concrete, it lacks towers like minarets, and it is painted with a variety of decorations and words. In the middle, towards the top of the front pillars, the number “1993” is written in Cham traditional letters, flanked on both sides by yin-yang figures. On the front side of the roof is a honkan, a symbolic figure of dualism in Cham society (see details in Section IV). Inside, one finds a wooden box-like pulpit called minbar, from which the acar recites the kura’an during the Friday prayer ritual (Photo 2). For the villagers, this pulpit should be placed to the west—“the direction of the Maka (Makkah).” The frame of the pulpit is painted red, with pictures of dragons that resemble the holy snake, Naga, as well as a gai bhong, a red rod wrapped in a white cloth. The red rod is considered to be a symbol of po Mohamat, Muhammad. The thang magik is unlike the Islamic mosque—it is closed most of the time and people do not enter for prayers five times a day—but like other Islamic religious centers, it is regarded as the main communal setting for rituals, which are administered on Fridays of certain months of the lunar calendar (Table 4). The acar carry out Islamic religious practices on behalf of the villagers, such as recitation of the kura’an, but they do not follow Muslim duties strictly, not even the requisite prayers five times a day. In fact, they are not considered by the villagers as simply priests but also as representatives of each descent group because of the important role they play, particularly in funeral rituals and ancestor worship. Therefore the motivation to become an acar is usually explained by a desire to serve the descendant group. members, and is not reserved solely for the acar. Boys who reach the age of 12–13 years old must study Arabic text in the kura’an at the thang magik. When they are able to recite some phrases and pass an exam, they celebrate this rite of passage called talaik kalem,14) after which they are given the right to study the kura’an. Photo 3 shows a textbook for the laity that was edited by an acar living in Ninh Thuan province in 1971. Written in Vietnamese on the cover are the words: “the sacred phrases to serve your ancestors,” and in the preface the sentence: “akhar rah akhar mukey, akhar ta-a” (phrases of rah, phrases for ancestors, phrases for praying). These three phrases are effective in ancestor worship and must be studied by Bani males. The textbook also quotes four passages from the kura’an that the Cham Bani recite for ancestral service, when visiting a graveyard, and during a funeral. Thus it can be seen that in Cham Bani society, reciting from the kura’an serves as an offering to ancestral spirits and not as a Muslim duty. Source: Author’s research in July and August 2011. Next I will describe the ritual process in Ramadan. For the villagers, Ramadan, which they call Ramuwan, is the most important season in their religious life. It is a sacred month because it is the time when ancestors return home, and the acar stay at the thang magik for one month and adhere to a vegetarian diet. Although Ramuwan has been described as a distorted version of the Muslim fasting month, the people do not actually fast. rites are similar to a memorial service. Three days before the first day of the month of Ramuwan, people visit the graveyards of their matrilineal lineage and invite their ancestral spirits back to their houses. After the three-day graveyard visits, people make offerings to the ancestral spirits residing in their homes. First, they prepare a meal offering to every ancestral spirit, then they make individual offerings to descendant members who have passed away. These offerings are made by male members who recite the kura’an, and who are usually acar; however, the oldest woman of the household usually has the responsibility of remembering the names of the deceased over a span of approximately seven generations.15) After the offerings, a place for the ancestral spirits is set up in the house, and an individual is responsible for keeping this place clean at all times. On the first day of Ramadan, after sunset, the acar enter the thang magik. This marks the beginning of the holy month of Ramuwan. 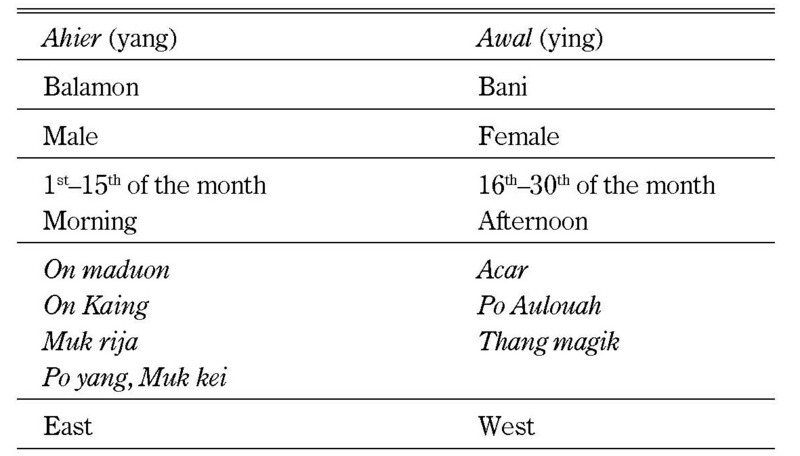 During this month, they stay in the thang magik, away from their families to serve Allah five times a day; however, as Table 6 shows, the names and times of prayers are different from Muslim prayers. Laywomen and elderly men, all dressed in white, watch and participate in these prayers, but they do not recite the kura’an. The main function of the females is to bring sets of betel nuts for the ancestral spirits and to pray for blessings. Women’s participation in the religious ceremony is crucial and they play a significant role. The wife, or other female members of the descendant group, prepares special meals for the priests twice a day—before sunrise and after sunset. According to a woman of a house that I observed, the rice prepared by the women is eaten in the morning by the priests for ancestors, and in the evening, it is eaten for po Auluah. While the priests fast for the first three days, laypeople do not observe the ritual of fasting at all; nevertheless, they are forbidden from eating meat for the first three days of the month, until the “red rod” is deposited.16) Women make special offerings for female spirits on the 15th, and for male spirits on the 20th. Offerings continue to be made for ancestral spirits at the mosque until the 27th, when they return to their world. As I mentioned earlier, the acar and laypeople have different prayers. The prayers of the acar begin with a part called vat and finish with a section called mroi. Vat starts with ablutions, followed by a fixed sequence of movements: standing, prostrating, kneeling, and sitting, each conducted with a set reading from the kura’an, with the acar facing west all the time. After the vat, the acar sit up facing east and eat an offering for po Auluah or ancestors, then transition into the mroi, the closing ceremony that includes burning a piece of eagle wood. The laity’s prayers, called lancan and tampah, do not include reading from the kura’an instead the people make individual wishes for health and prosperity—in short, worldly interests. They do not consume food offerings but bring some home as a food of grace. As we have observed, people visit graveyards to bring ancestral spirits back home, make offerings to these spirits, and visit the thang magik with betel nuts offerings. They pray to po Auluah, but as we have seen, Ramuwan is mostly a month for memorial services and prayers for benefits. Source: Nakamura (1999) and author’s research. Nakamura, based on her lengthy fieldwork, also traced the Cham religion from the perspective of Awal- Ahier (Nakamura 1999). According to Nakamura, all the phenomena of Cham society are constituted in the form of binary oppositions: for example, the relationship between Cham Balamon and Cham Bani achieves a harmony with the former belonging to Awal and the latter to Ahier sects. The religious elements in the Cham Bani village are drawn from a combination of Awal and Ahier elements (see Table 7). Photo 5 is a honcan, a figure that illustrates the concept of Awal-Ahier dualism. As mentioned earlier, this figure, which resembles the Onkara of Balinese Hinduism, is painted on the roof of the thang magik in the village. Cham Bani is symbolized by the figure of the moon and the number 6 in traditional Cham letters, while Cham Balamon by the sun and the number 3. Together it demonstrates the fusion of the two. This concept of Awal-Ahier is emphasized by Cham Bani intellectuals and ordained priests in discussions about Islam in Cham society, possibly as a means to validate the “authenticity” of the Cham Bani religion in the face of criticism by “orthodox” Islam and rejection of the indigenous elements within the Cham Bani religion. Awal-Ahier is understood as the syncretism that affirms the tolerance of Cham society. For these intellectuals, the Islamic religious practices of Cham Bani should be viewed through the Awal-Ahier perspective, rather than categorized as Islamic or non-Islamic. In my opinion, however, ordinary people are unfamiliar with these concepts and only understand that they are practicing their religion in the age-old, long-established manner. As mentioned in the first section, the Cham Bani have been considered as unorthodox Muslims because they recite the Quran and believe in Allah, yet do not strictly follow the Islamic faith. This perception is based on the idea that those who recite the Quran and fast during Ramadan are performing their Muslim duty and partake in the “commonality of Islam.” This is a perception based on essentialism. Such classification is unrealistic. As we have seen, Islamic religious practices among the Cham Bani differ widely depending on gender or social strata. Members of the Cham Bani do not have a single feature in common across the board. In other words, it can be said that the Cham Bani is a polythetic class. Hồi giáo in Vietnam, regardless of the criteria used in the classification, is indeed a polythetic class, as opposed to the conventional classification of Muslim. On the question of self-recognition, not all of those officially classified as “Muslim” or Hồi giáo identify themselves as Muslim. Cham Bani people actually identify themselves as followers of Hồi giáo, calling themselves tín đồ Hồi giáo or tín đồ đạo Hồi. This does not, however, mean that they accept to be identified with Islam. They describe themselves as not of the Islam sect but Bani. In other words, they subscribe to a Vietnamese religious category that includes Cham Islam and Cham Bani, but not one where Islam is connected with the wider Islam community. To put it another way, the word “Islam” has two meanings in Vietnam: the first is Islam in a broad sense as the English translation of Hồi giáo the second is Islam in a narrower sense as one of the groups of Hồi giáo—Cham Islam or Sunni Muslim. Incidentally, it has long used the term “religious syncretism” by anthropologists to explain the phenomenon in which a new or an exogenous religion, introduced to a specific society, either mixes or coexists with local religions as it is adopted. Within this framework, the debate was centered upon the question of whether the exogenous and local religions coexist without eliminating the border between them, or whether they blend together in a seamless form to create a new and coherent religious system. This idea, however, has been criticized from many directions (Leopold and Jensen 2004). For instance, some argued that all religions currently practiced are the products of syncretism, having incorporated elements from many different religious traditions. Others were concerned that because the idea of “authentic religion” is inherent in the idea of syncretism, it has imputed negative connotations such as “impure” and “inauthentic” to the real religious phenomena. Anthropologists have focused on the discourses on syncretism or the processes through which different religions merge, examining how power is exercised in the process of legitimization or de-legitimization of certain religious practices (for example, Stewart and Shaw 1994). While some cultures embrace syncretism as evidence of their tolerance toward different cultures, others hold an “anti-syncretic” attitude, asserting their cultural “authenticity” by rejecting or erasing the “impure” cultural elements from their practices. How then does religious assimilation occur in Vietnam? How does the foreign religion become “indigenized” (dân tộc hóa)? In the case of Cham Bani, this occurs by sustaining the worship of ancestors (muk kei) and deities (yang), including spirits of the members of each descendant group, village gods, and spirits of Champa kings or those who have served the kingdom. These are the local religious elements shared with the Cham Balamon, another religious group among the Cham. It is precisely in this way that Cham Bani differentiate themselves from Cham Islam by sustaining these elements. Aymonier, Etienne. 1906. Dictionnaire Cam-Français [Cham-French dictionary]. Paris: Ernest Leroux. Catabon, Anton. 1901. Nouvelles recherches sur les Chams [New research on the Cham]. Paris: Ernest Leroux. Đặng Nghiêm Vạn 2004. Về Chính Sách Tự Do Tôn Giáo ở Việt Nam [About religious freedom policy in Vietnam]. In VềTôn Giáo và Tôn Giáo ở Việt Nam [Religious issues and Vietnamese religions], edited by Viện Khoa Học Xã Hội Việt Nam [Vietnam Academy of Social Science] and Tạp chí Nghiên Cứu Tôn Giáo [Journal of Religious Studies], pp. 292–312. Hà Nội Nhà Xuất Bản Chính Trị Quốc Gia. Dohamide. 1965. Hồi Giáo tại Việt Nam [Hồi giáo (Islam) in Vietnam]. Tạp chí Bách Khoa 197: 50–56. Durand, R-P E. M. 1903. Les Cham Bani [The Cham Bani]. Bulletin de l’Ecole Francaise d’Extreme Orient 3(1): 54–62. Eickelman, D. F. 1982. The Study of Islam in Local Contexts. Contributions to Asian Studies 17: 1–16. El-Zein, A. H. 1977. Beyond Ideology and Theology: The Search for the Anthropology of Islam. Annual Review of Anthropology 6: 227–254. Kosugi Maria 小杉麻李亜. 2008. Isuramu Sekai ni okeru Sara (Reihai) no Sogoteki Rikai o Mezashite: Chuto to Tonan Ajia no Jirei o Chushin ni イスラーム世界におけるサラー（礼拝）の総合的理解をめざして―中東と東南アジアの事例を中心に [Comprehensive understanding of Salah (worship services) in Islam: Examples in Middle East and Southeast Asia]. Isuramu Sekai Kenkyu イスラーム世界研究 [Islamic world studies] 1(2): 165–209. Leach, E. R., ed. 1968. Dialectic in Practical Religion. Cambridge: Cambridge University Press. Leopold, A. Maria; and Jensen, J. Sinding, eds. 2004. Syncretism in Religion: A Reader. New York: Routledge. Leuba, Jeanne. 1915. Les Chams d’autrefois et d’aujourd’hui [The Cham of today and the past]. Revue Indochinoise 7–12. Nakamura, Rie. 2000. The Coming of Islam to Champa. Journal of the Malaysian Branch of the Royal Asiatic Society 73(1): 55–66. ―. 1999. 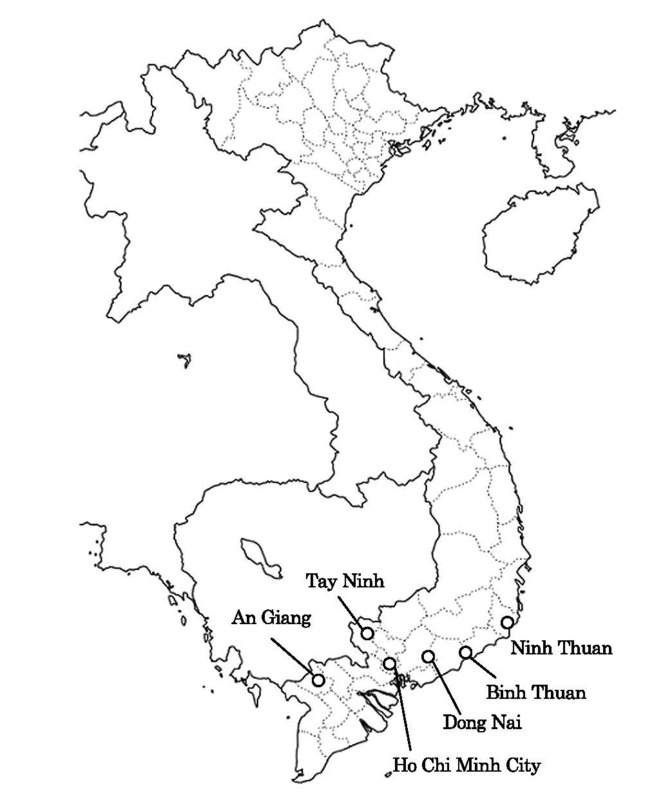 Cham in Vietnam: Dynamics of Ethnicity. PhD dissertation, Department of Anthropology, University of Washington. Needham, Rodney. 1975. Polythetic Classification: Convergence and Consequences. Man 10(3): 349–369. Ner, Marcel. 1942. Les musulmans de l’indochine francaise [The Muslims in French Indochina]. Bulletin de l’Ecole Francaise d’Extreme-Orient 41 (2): 151–202. Nguyễn Văn Luận. 1974. Người Chăm Hồi Giáo Miền Tây Nam Phần Việt Nam [Cham Islam in the southwestern Vietnam]. Sai Gon: Bộ Văn Hóa Giáo Dục Và Thanh Niên. Phan Xuân Biên; Phan An; and Phan Văn Dốp. 1991. Văn Hóa Chăm [Cham culture]. Thành Phố Hồ Chí Minh: Nhà Xuất Bản Khoa Học Xã Hội. Phú Văn Hẳn. 2004. Cộng Đồng Islam Việt Nam: Sự Hình Thành, Hòa Nhập, Giao Lưu và Phát Triển [Islam community in Vietnam: Formation, adaptation, interchange and development]. In Về Tôn Giáo và Tôn Giáo ở Việt Nam [Religious issues and Vietnamese religions], edited by Viện Khoa Học Xã Hội Việt Nam [Vietnam Academy of Social Science] and Tạp chí Nghiên Cứu Tôn Giáo [Journal of Religious Studies], pp. 529–542. Hà Nội Nhà Xuất Bản Chính Trị Quốc Gia. Shirakawa Takuma 白川琢磨. 2007. Shimbutsu Shugo to Tahairetsu Kurasu 神仏習合と多配列クラス [Shinbutsu Shugo and polythetic class]. Shukyo Kenkyu 宗教研究 [Journal of religious studies] 81(2): 235–258. Stewart, Charles; and Shaw, Rosalind, eds. 1994. Syncretism/Anti-syncretism: The Politics of Religious Synthesis. London and New York: Routledge. Thành Phần. 1996. Tổ Chức Tôn Giáo và Xã Hội Truyền Thống của Người Chăm Bà Ni ở Vùng Phan Rang [Religious system and traditional society of the Cham Bani in Phan Rang]. Tạp San Khoa Học 1: 165–172. Vietnam, Central Population and Housing Census Steering Committee (CPHCSC). 2010. The 2009 Vietnam Population and Housing Census: Completed Results. Hà Nội: CPHCSC. Vietnam, Government Committee for Religious Affairs (GCRA). 2006. Religion and Policies Regarding Religion in Vietnam Hà Nội: GCRA. Wittgenstein, L. 1967. Philosophical Investigations. London: Basil Blackwell. Yoshimoto Yasuko 吉本康子. 2011. 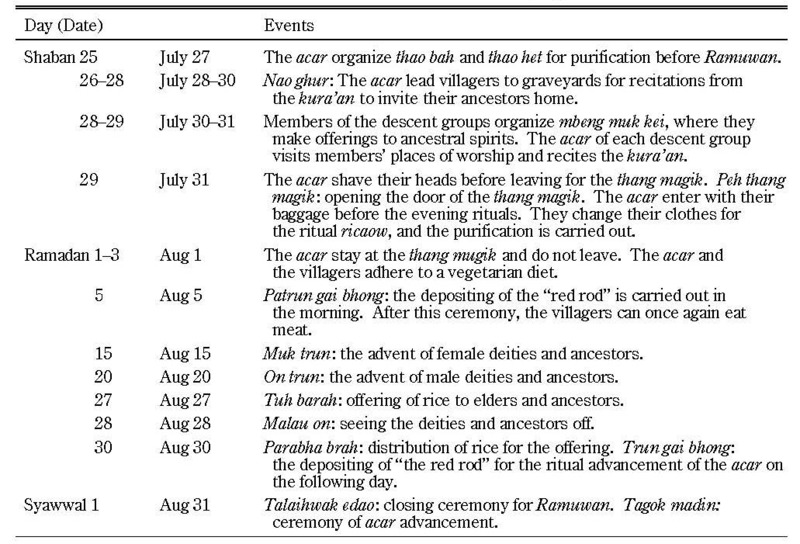 A Study of the Almanac of the Cham in South-Central Vietnam. In The Cham of Vietnam: History, Society and Art, edited by Trần Kỳ Phương and Bruce M. Lockhart, pp. 323–336. Singapore: NUS Press. ―. 2010. Isuramu Sei to Esunikku Yoso o Meguru Kosho Katei ni tsuite no Ichi Kosatsu: Betonamu ni okeru Chamu-kei Musurimu no Jirei o Chushin ni イスラーム性とエスニック要素をめぐる交渉過程についての一考察 ― ベトナムにおけるチャム系ムスリムの事例を中心に [A Study of negotiating process over Islam-ness and ethnic elements: A case of Cham Muslim in Vietnam]. Bunka Kosho ni yoru Henyo no Shoso 文化交渉による変容の諸相 [Aspects of trans-formation through cultural interaction]. Kansai Daigaku Bunka Koshogaku Kyoiku Kenkyu Kyoten, Jisedai Kokusai Gakujutsu Foramu Shirizu 関西大学文化交渉学教育研究拠点，次世代国際学術フォーラムシリーズ [Institute for Cultural Interaction Studies Kansai University, The international academic forum for the next generation series] 2: 223–247. 1) The first statistics in 1999 identified six state-recognized religions; by 2011 there were 12 state- recognized religions, including Baha’i, Buu Son Ky Huong, etc. 2) Champa is one of the oldest kingdoms in Southeast Asia, having been established around the second century in what is today’s central Vietnam. 3) The presence of two groups of Muslims is regarded as a result of differences in the process of Islamization. The Islamization of Champa is believed to have occurred through contact with Islamic Arab merchants and the Persians, from the ninth to eleventh century, and through the Malays, from the sixteenth to seventeenth century. The Cham Bani could have been a group of people who stayed behind even after the country was deprived of maritime trade with Islam. The Cham Islam might be a group of people who moved to Cambodia and then the Mekong Delta whose practice of Islam was intensified through contact with the Malays (Nakamura 2000). 4) Other labels like “folk Islam” or “islam” in lowercase letters (Eickelman 1982; El-Zein 1977) have also emerged. 5) The meaning of practical religion here is that found in Dialectic in Practical Religion (1968) by Edmond Leach. 6) Bà la môn giáo has been described as indigenized Hinduism. For example, see Phan et al. (1991). 7) This caused clashes with other Cham Bani, who saw no contradictions with their traditional religious practices. 8) My fieldwork was carried out mainly among the Cham communities in Bac Binh district, Binh Thuan province in 2001, 2002, and 2011. 9) According to the elders in the village, the villagers were forced to move under the Strategic Hamlet Program in 1959. 10) There are several types of kura’an in Cham Bani: patar murat, janreng gar, etc. In any of these kura’an, phonetic transcriptions and explanations, written using the traditional writing system called akhar thrah, are inserted. 11) Villagers use the Western calendar and the Vietnamese lunisolar calendar on a daily basis while the traditional calendar, sakawi, is used for customary rituals. The sakawi plays no role in most people’s lives; only religious priests and intellectuals consult it for information and guidance in organizing rituals and annual events (Yoshimoto 2011). 12) According to Aymonier’s Cham-French dictionary, magik means “masjid” and thang means “house” (Aymonier 1906, 367). 13) There are no differences in the laity’s prayers no matter what rank. Laymen’s prayers for po Auluah are also no different from that for po yang; po Auluah is positioned as one of the deities. In this respect, po Auluah is manifestly not the same as the Islamic god Allah. 14) Talaik (open) kalem (a brush) means “begin writing.” This ritual consists mainly of boys reading aloud the Arabic alphabet called akhar Bini and bismillah (the phrase uttered before reciting each chapter of the Quran), following the acar’s direction. 15) In a house that I observed in 2010, in Ninh Thuan province, a woman around 52 years old said she invited about 50 spirits and members, both of matrilineal and patrilineal lineages. She said her deceased mother used to invite about 80 spirits and members, but she could not remember all of them so the number was reduced. 16) The length of abstention from meat depends on the area: for example, the Cham Bani in Ninh Thuan province are forbidden to eat meat for 15 days. 17) For example, Đặng (2004).